Howmany customers does the grocer around the corner have ? Howmany customers do you have on your website ? Howmany cars are there that use a particular crossroad ? 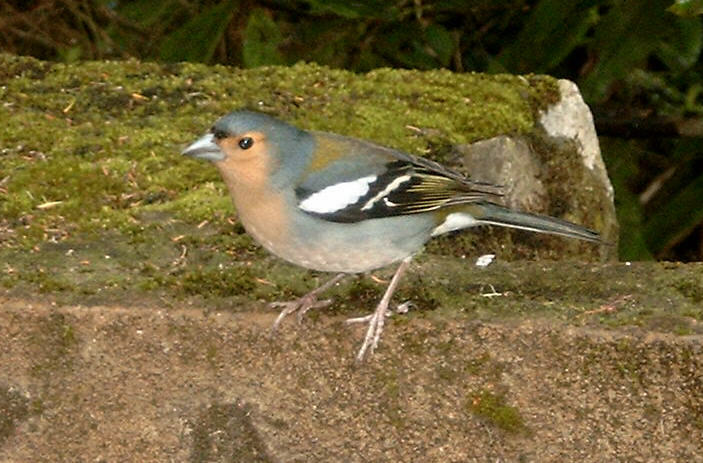 Howmany birds of a particular species live in a determined patch of forest ? Howmany ? Is there a way of finding out ? A first step is simple : Unique visitors in a given period of time. – You just watch the grocery for an afternoon and count all people that enter. Make sure you do not count the returning one that forgot the suger twice ! – Get the unique visitor number of your website from Google Analytics ore whatever web analytics tool you use. – Get a mojito from the bar at the corner and write down all license numbers you see, for one or two hours. Afterwards eliminate al returning ones. – take a walk that covers the entire forest patch and count each individual of that particular bird species. Simple, is it not ? What about the loyal grocery customers that came yesterday and will return tomorrow ? You missed them. Not everyone visits your website all the time. Some people leave their car at home and take a walk … to the forest where not every bird will show itself or will be singing. Realise you only got a fraction of the number. In biology they use something like capture-recapture. If the first time you captured 100 birds, the second time you captured the same number and 25 of them were already ringed, you can say that in your forest 1/4 of the birds are ringed, so the forest contains a total of 400 birds. Idem for you website : if 50 % of your visitors are returning ones, you may say that you have twice the amount of coockies dropped as visitors. – birds that are captured once become much more shy. They will be under-captured the second time. – not all people have the same activity on the internet , or on the road. They do not all have the same probability of showing up. And some delete their coockies ! – The first day perhaps there was a tourist or two in the grocery who will never return ! Perhaps there is more to learn when we take the figures for a number of periods in succession, like say, capture birds or monitor the number of signons on your websitefor two weeks in a row. – an estimation of the total population ? – what is the total number of identified individuals (ringed birds, website visitors who signed up) ? This first extreme should show us the actual, stable situation. 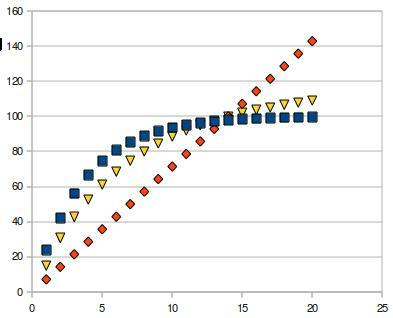 The chart shows two lines : the highly fluctuating line is the percentage of identified individuals, day per day, whereas the more stable line shows the cumulated data. These cumulated figures tend towards the real % of identified individuals in the population. Here we see that 24% carries an ID. By simply using the proportion we can easily calculate the total number of individuals. OK, for birds in a forest it is simple, but for website visitors it is a bit more complicated. Not every visitor with an username/password for your website will sign on each time he visits, but let us assume this is the case anyway, for now. 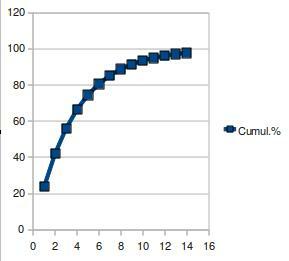 The second chart shows the theoretical cumulative proportion of ID’d individuals. If each day 24% is ID’d, after 14 days nearly 100% of them will be captured, seen or have visited your site. What about this second extreme ? This really means that you do not have any returning visitors, or that each bird you capture is some migrant passing trough. So you never see ID’d or returning individuals. Not much information to show. Only the average number per day is interesting. The straight line shows the total number after the 1st, second, third, etc. day. Each day about the same number of individuals come along, but each day these are new ones, so they simply add up. In real life you will find something in between the two lines (the yellow dots in the following chart). The closer your real-life line is to the curved one, the more stable your population of birds or website visitors. The closer to the straight line, the more volatile your population. “Something between the two lines” actually means that you deal with two populations : your loyal returning customers (or you sedentary birds in the forest) and your one-time-customers( or birds accidentally passing through). Considering this, it should be possible to reconstruct your actual, intermediate line, by combining the lines of these two populations… if only you should know them. The blue squares are the “actual” observations, the red diamonds represent the theoretical line for the “sedentary” population and the blue triangles show the one-pass-and-never-return population. The two latter sum neatly up to match the actual observations. What are the columns in my spreadsheet ? 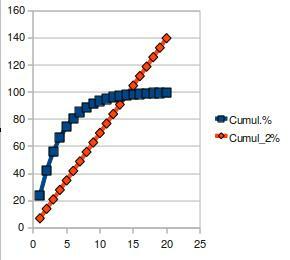 3. stable population (“theoritical” curve). This is more complicated. The first cell is a fraction (let’s say 25%) of the total number we will have seen on for example the 14th day. 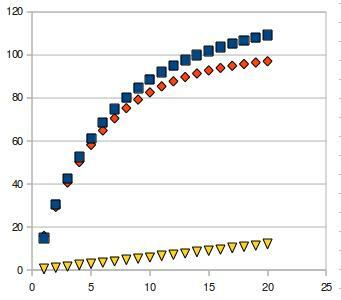 The second cell equals the first+the same fraction (25%) of the rest of the total number and so on. 4. the actual data = the cumulative number of individuals observed the first day, the first two days, the first three days etc. Now you just have to tweak (play with) the three numbers : the one for the volatile population and the two (total number + fraction) for the stable population until the two populations sum up to (nearly) exactly the same data as column 4. 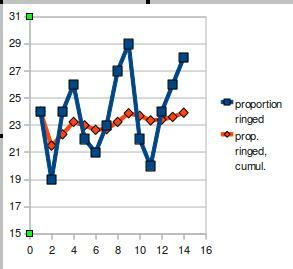 OK, this tweaking is not very scientific. You could do the necessary programming to obtain automatically the desired result or, if you are good at math, derive some equation to reach your goal more efficiently. At the end the result will be the same. Men are more accurate than women … or lousy statistics ? « Does Avatar show the future?